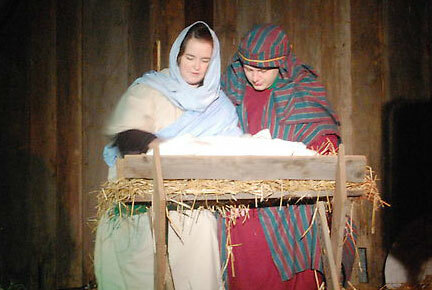 A scene from the 2010 live nativity at Oakvue Farm. The local holiday tradition of the live nativity at Oakvue Farm in Bristol continues in 2014 on Dec. 12 and 13. The living nativity — which includes live animals and a cast of 40 — will be presented Friday and Saturday evening, with two presentations each night. On Friday, Dec. 12, the approximately 30-minute presentation will take place at 6:30 and 7:45 p.m.
On Saturday, Dec. 13 the presentations will be at 3:30 p.m. and 6:30 p.m. The nativity started out as a project of the Gillmore family and a few friends and neighbors, said Ed Gillmore. But as the years have gone on, people have experienced the nativity and have wanted to help out too. Besides the people portraying the various characters in the story, live animals are used. There also is a choir that accompanies the scenes with music. There is no admission charge, but donations are accepted. Afterwards, enjoy free cookies and refreshments. The farm is located at 14700 104th St. (Highway Q) about 1.5 miles west of the Interstate 94. Call 262-206-0566 for more information.